Can you imagine a better friendship than the World’s Best Beauty Salon and Melbourne’s premiere Dentist? To celebrate our newest neighbourhood love, we’ve created a magical experience to brighten your smile, and your skin. Feel utterly ethereal with our Glow Giveaway, including a Zoom! Professional Teeth Whitening service from Smile Solutions valued at $375 and a divine 90 minute Rose Gold Facial from MISS FOX featuring 24K gold, rose quartz and precious rose oils, valued at $303. We have 3 enlightening packages to share so you can shine bright. A luxe prize valued at $678. To enter, head to Instagram and follow MISS FOX @missfoxmelb and Smile Solutions @smilesolutions, then tag 3 friends in the comments that make life more magical. Hurry, entries must be in before 17th of April 2019 . This competition is in no way sponsored, endorsed or administered by, or associated with Instagram. Entry is open to residents of Victoria, Australia. Employees of Smile Solutions/MISS FOX and their immediate families, and Smile Solutions/MISS FOX Sponsors or Agencies are ineligible to enter. Entrants must be over 18 years or age to enter. 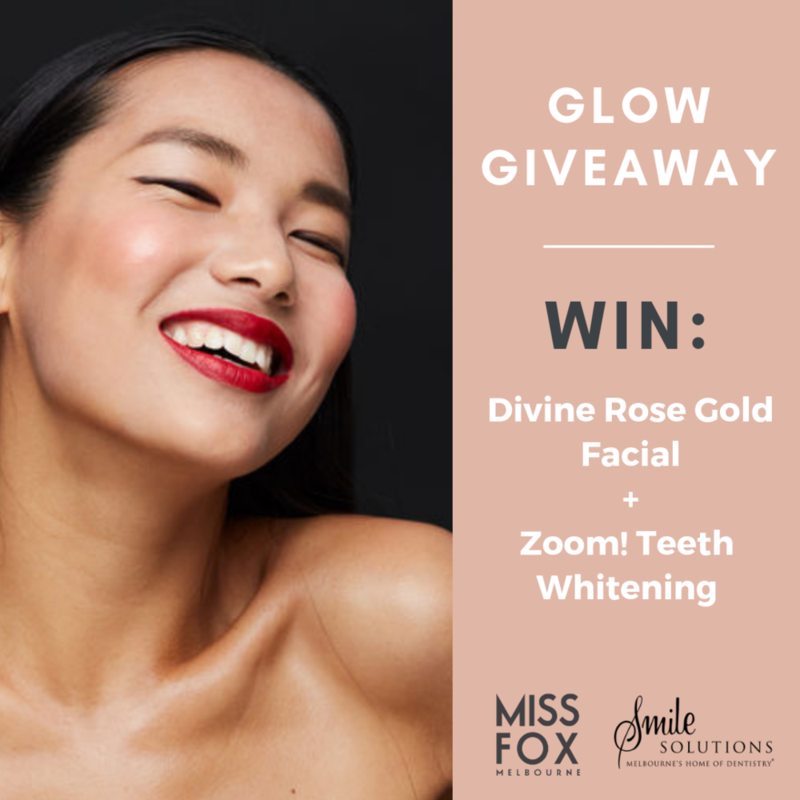 To enter the Golden Giftaway, participants must follow Smile Solutions and MISS FOX on Instagram and tag 3 of their friends in the Instagram comments on the @smilesolutions or @missfoxmelb Instagram giveaway post. The Promotion commences at 4.30 pm (AEST) on 29th of March 2019 and closes at 10 pm (AEST) on 17th of April 2019. Smile Solutions/MISS FOX reserve the right to amend, modify, cancel or withdraw this promotion and its terms and conditions at any time without notice. Three winners will be drawn on the 18th of April and announced on the 18th of April. Winners will be notified on Instagram and via email on the 18th of April. Each winner will each receive Zoom! in-chair professional teeth whitening at Smile Solutions (valued at $375) plus a Divine Rose Gold Facial at MISS FOX (valued at $303). Prizes are non-refundable, non-transferrable and cannot be redeemed for cash. The prize cannot be used in conjunction with any other offer made by Smile Solutions or MISS FOX. Smile Solutions dentists advise a full examination and clean appointment prior to any professional teeth whitening treatment. Appointments for this offer must be made during our Teeth Whitening Centre hours ONLY. Please be advised this treatment is not suitable during pregnancy. Gift card for this treatment is valid for 6 months from date of competition end.